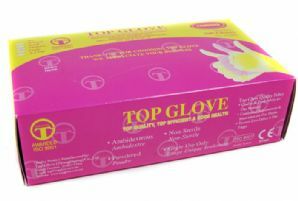 Vinyl Gloves single use 100 pcs. Non-sterile, non-powdered Vinyl gloves. Box of 100. Use and dispose. A huge number of applications in the darkroom. Ideal for anyone who wants to keep darkroom chemisty off their hands so it doesn't get transferred to washed prints later on. Or, if you like to use your hands directly when processing in trays, but the chemisty is irritable. Also very useful when washing trays, tanks and processors. The list goes on. Note: brand may vary from photograph.